We have started a wait list for the camps that are full. 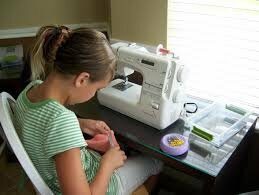 If you have a 10-14 year old that has interest in sewing or has experience sewing, these are the perfect camps for them. Projects will be determined by the skills of the student. Great opportunity to learn new techniques and how to sew! Tap into your child's creativity and watch it soar! **Please note: Camps and Clubs fill fast as soon as they open for registration. Be sure to plan ahead if you wish for your child to attend. You are not officially enrolled, until it is paid for.